The cleanest, safest, and most secure RV Park in Big Spring. With 24/7 security monitoring we provide a worry-free, extended-stay environment. Our pull-thru RV sites, which are equipped with 30/50 amp capabilities, are HUGE and provide enough room for more than three vehicles. All amenities, including electric, sewer, water, extended cable TV, and high-speed internet, are provided at one low price. As an extended stay guest, you are invited to use our state-of-the-art clubhouse with laundromat, showers, pool tables and fitness center as well. Our on-site propane services make it so there is no reason to have to drive anywhere else to get your propane tanks refilled. 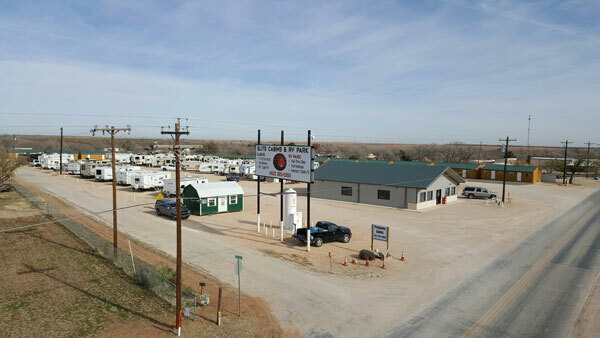 We are just outside of Big Spring for a reason: to offer you the best location to park your RV in a home-away-from-home for a safe, quiet, comfortable and affordable lodging. We hope to see you here. For the convenience of our guests, we offer propane services on site! We can fill your RV, truck, or propane tank and always do so quickly and safely. We strive to offer competitive prices so you never have to worry about going anywhere else. We are open from 9:00 a.m. to 5:00 p.m. and by appointment on the weekends. Call or contact us with any of your questions! The Elite Cabins and RV Park clubhouse is the place to go to relax, visit with other guests, and enjoy our other amenities like our laundry facility, pool tables, fitness center, showers, and more in a climate controlled, comfortable setting. We clean our facilities regularly and monitor them for your safety and enjoyment. Next time you’re in town, sink-in and relax in our leather couches or take your fitness to the next level with our state of the art gym with G-5 Fitness full body training system, Life Fitness treadmill, and Precor elliptical machine. Learn more about our clubhouse and see pictures of our amenities. Check out all that Big Spring has to offer and come stay with us! Learn more about our local restaurants and start planning your extended stay with us in Big Spring! Do you travel a lot and wonder how to stay grounded and connected to your loved ones? Struggling to make your RV feel like home or bored and need some ideas what to do on a Friday night? Not sure where to head next? Read the Elite Cabins and RV blog! We post regularly about topics that mean the most to our extended stay guests. Read recent blog posts below or check out our archive. We hope you enjoy our blog and hope to see you soon!